This is an announcement reprint pulled from the archive pages of my TalkingStory.org blog, thus it is not the normal sales page, but one preserved in very happy memory connected to our practice as a Managing with Aloha global community. All the book publishing I have done has kaona: Each work came about as result of a HO‘OHANA story of some kind, and not because I’d set out to write a book, though I am now thrilled to have them! Sharing the back story connected to each work helps me keep my specific HO‘OHANA intentions and MAHALO thankfulness woven into our continuing practice of the learning each one represents. Learn more about HO‘OHANA, MAHALO, and the values which have driven all my stories of ALOHA here: The 19 Values of Aloha. Living with Aloha remains such a gift in my life, a gift I’m honored to share with you. This ebook will teach you about Value Mapping, a learning/doing process within the Managing with Aloha philosophy of worthwhile work. In building values-based habits you develop a way of belief-aligned living wherein good begets good, beginning with the inherent truths which already reside within you. We started by declaring 2011 the Year of Better Habits. 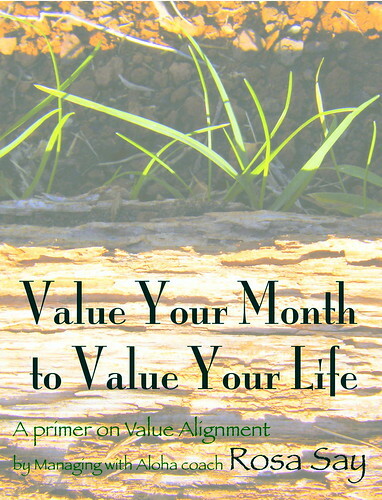 Then you sent me a question about the Value Your Month to Value Your Life program I’d done before. Answering that question spun off into a collection of 5 more posts. I’m always encouraging all of you to finish well. I should lead by setting a good example. Chapter 2 – Where did our values come from? It’s selling on Smashwords for $4.99. If you have a Kindle I’m especially loving how it turned out in that format, however you’ll have to get it from Smashwords for now (very easy… how-to here. Be sure you open the documents folder in your Kindle). One more thing: Thank you so much for pushing me to be better as you do. I think you’ll especially like what I’ve added in that 19-value addendum: Each Managing with Aloha value has application suggestions for either value immersion, value steering, or both. Our Year of Better Habits? Already is! Better and going for Best.